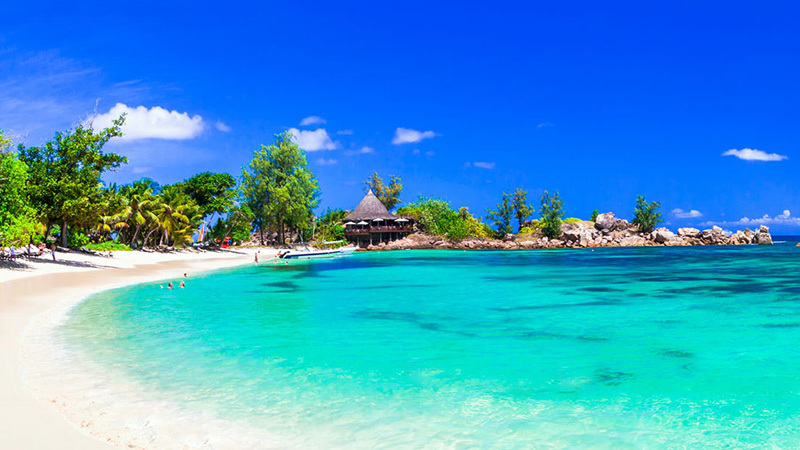 There’s good reason the Seychelles is associated with romance – you cannot help but fall in love when you get there. This Indian Ocean escape remains top of the list for many couples on honeymoon or celebrating a landmark anniversary and plenty more who choose its Insta-perfect beaches when tying the knot. Hilton Seychelles Northolme Resort & Spa General Manager Daniele Fabbri still enjoys witnessing the effect this little corner of perfection has on arriving guests. Some, he confirms, came as newlyweds before Hilton began managing the resort 14 years ago – and return to mark a major anniversary. The Italian also cites the United Arab Emirates as a growing, important market for the villa-only resort. Perched above Beau Vallon Bay, on main island Mahe, just 25 minutes drive from the airport, Northolme benefits from regular Emirates flights and Air Seychelles’ Abu Dhabi service, with last-minute bookings and long weekenders on the rise. In around five hours from turning the key at your home in Dubai, you can be on the spacious balcony of one of Northolme’s ocean-facing wooden villas. Resort planners made the most of the location, with the perfectly placed Hilltop Restaurant being your stunning breakfast venue, also offering nightly themed buffets. There’s also Les Cocotiers, home to sublime fusion cooking powered by local Creole cuisine. The resort location was favoured by James Bond author Ian Fleming in the 1950s; Oceanview Bar & Restaurant celebrates the connection alongside the view that inspired For Your Eyes Only. The gym’s running machines, eforea spa and the infinity pool give further panoramic angles. You can get among those waves – and learn about the hotel’s efforts to help restore the island’s damaged reef system – snorkelling alongside a resident marine conservationist. There’s even an opportunity to adopt a piece of coral via the Marine Conservation Society, with which the resort collaborates. With an over-13s policy, Northolme is tranquil, romantic and as private as you wish. There are five villa configurations, some with pool, so there’s little need to venture anywhere else. If you do, we recommend heading around the bay midweek for BBQ fish and live music at Bazar Labrin night market. There’s also an engaging environmental drive available across the water at Silhouette Island. 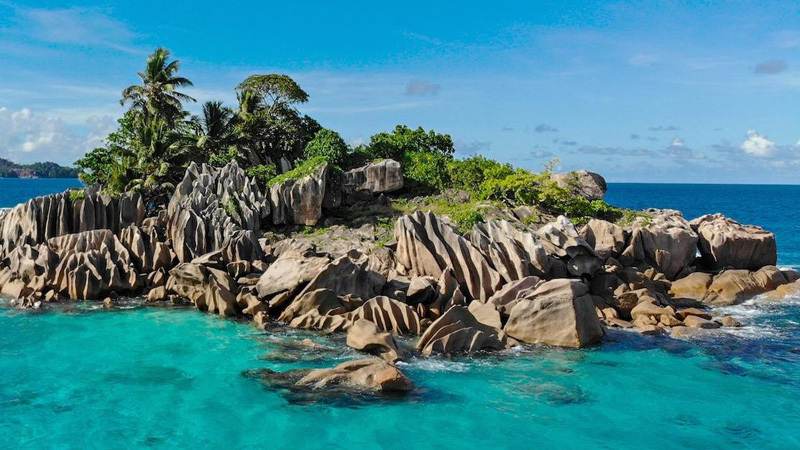 Accessed via ferry from Hilton’s dedicated jetty in the nation’s capital Victoria, the Seychelles’ third largest island is home to Hilton Seychelles Labriz Resort & Spa – a 111-villa escape delivering a more family-friendly vibe, beside discreet hideaways for couples. Silhouette’s sole resort utilises a stunning location blessed with endless white sands fringed by lush tropical gardens and a choice of villas accessing both aspects. Shaded paths connect seven dining opportunities, from fine Mediterranean food at Portobello and casual beach bar fair at 4th Degree to delicious Asian cuisine fresh outta’ Sakura, with Grann Kaz, serving authentic Creole creations such as octopus curry and sausage rougay in a restored plantation house. Eforea spa occupies one of the most dramatic settings, with treatment rooms and a hot tub nestled amid ancient boulders and rainforest. Hiking routes – guided or self-led – press further into hilly foliage as large fruit bats frequently fly overhead. Book a boat trip to the far side of this mostly national park-designated sanctuary to meet the area’s oldest residents – protected giant tortoises. Some are thought to be 140-plus years old, according to the weekly nature talk in Lo Brizan Bar, beside the resort’s ocean-facing pool. Review your photos in one of several villa choices – from one bedroom to King Presidential, beachfront or hillside with pool. Our elegant king garden villa boasted a high wooden ceiling, modern fixtures, a terrace with loungers and a spacious bathroom with tub and rain showers inside – and in a secluded rear garden. For more marine conservation, head to Hilton’s third resort, DoubleTree by Hilton Seychelles – Allamanda Resort & Spa, in south Mahe. You’ll find a coral nursery in tanks beside Les Palms restaurant and good reason beyond the hotel’s ample decking, pool and standalone spa; amid the scuttle of tiny crabs this dedicated beach is one of many that dead coral fragments wash up on. A more affordable option, the DoubleTree has a boutique feel with sea-facing rooms, including King Deluxe options sporting a balcony-placed jacuzzi. It’s a prime starting point for exploring the island. At about the length of driving between Dubai’s two airports, it’s easily navigated and you can discover secluded bays, idyllic beaches and lofty vistas such as Mission Lodge for views of central Mahe and the west coast.